A Gold for Malaysia Perhaps? So today is the big day, or rather tonight is. The million dollar question...Can Datuk Lee Chong Wei beat his nemesis to get the gold medal in the Olympics? If he does, it would be many of a list of first for Malaysia; Malaysia's first gold medal in the 2012 Olympic, Malaysia's first gold medal in the Olympics, and Malaysia's first medal in the 2012 Olympics (if the Men's Double fails to secure a bronze medal this evening). It is interesting to note that Malaysia's previous medals in Olympics have all come from badminton. 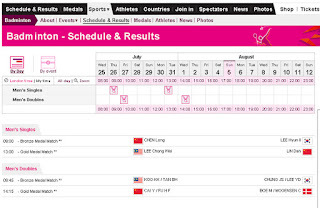 Schedule of the badminton matches for today. Please add 8hrs to get the approximate starting time in our local time. P.S. 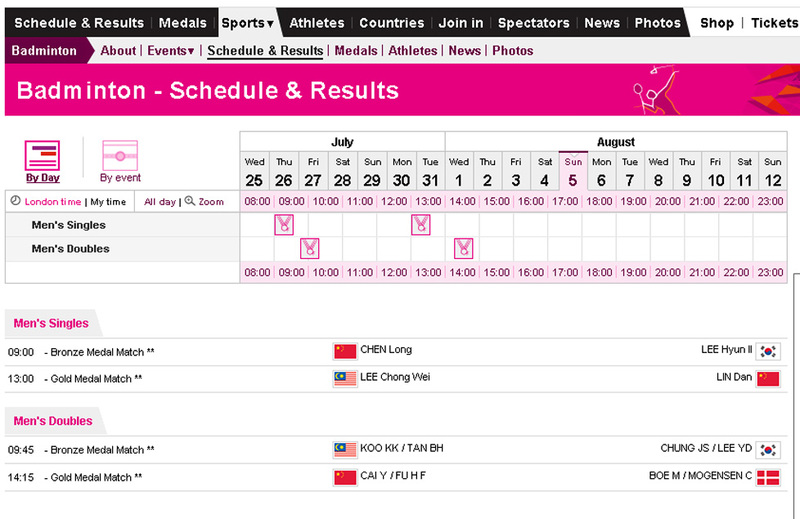 Perhaps Lin Dan should get a bear death-hug from someone, then the odds for Chong Wei will be higher than 90%. Yes Datuk Lee Chong Wei carries a heavy burden to secure first olympics gold in Malaysia history. I hope he does not fall the pressure that much and give his best performance. Just enjoy the game, it is really good for him to at least give us a silver/gold medal. He has already earned himself as Malaysia sportsman legend in the future. So far, Malaysia has only collected 4 medals in Olympics. If he gets a gold medal the tittle Tan Sri hopefully will be bestowed to him. Its such a shame that squash is not in Olympics or we will probably secured medals in that game as well from Nicole. In Australia, the swimming team has been totally slandered by the press. Too much expectation I guess and we are just collecting silvers. Yeah, if squash is in the Olympics, Malaysia will be getting gold medals. I think is is unfair to the athletes, the way the press puts them on the pedestal and when the expectations (created by the press) are not met, the press then goes to trash them out. Clearly this only benefits the press, i.e. readership. Sad, but that is how the money goes. Sigh. I am also keeping my fingers crossed, hoping ... that our Malaysian dream comes true tonight. Whatever happens, Dato Lee Chong Wei is certainly a great sportsman. Both he and Nicole are world class level. It was a tough match, but sadly he lost the match. Anyhow it was a good fight to the end. Watched it with friends at Pavilion. The crowd was amazing. It breaks my heart to see the tears in his eyes. Glad i watched the match, emotions and all. He had united Malaysians and he is definitely our WINNER! True, that is what makes him a winner. Not a gold medalist, but a winner of Malaysian hearts.